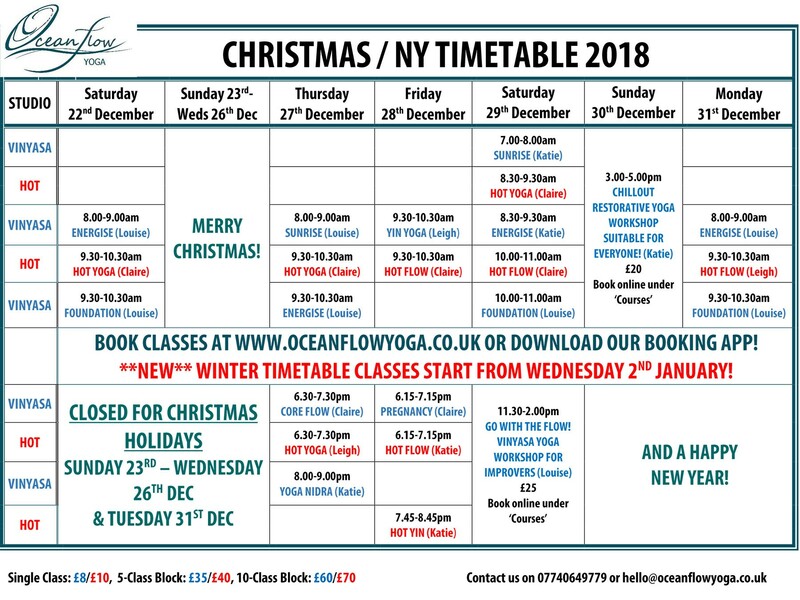 We will be open over the majority of the Christmas Holidays with a special timetable so look out for your fav classes maybe at a different time or day! BOOK via the online booking system or use the app. We recommend booking online to guarantee your space and you don’t have to be a member to come along to our classes. Check out our VISITORS page if you’re down in the area over Christmas and want to know more about the studio and classes that we offer here! 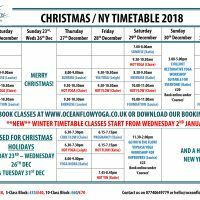 Also we’re running a Vinyasa Improvers Workshop with Louise on Saturday 29th Dec 11.30-2pm and a Restorative Yoga Workshop with Katie on Sunday 3oth Dec 3-5pm so a great chance to deepen your practice over the festive season. Also makes for a great gift for family or friends so get in touch with us at hello@oceanflowyoga.co.uk to chat with us about Gift Vouchers!